OK, I admit it. There are a few things I enjoy about the 2 year old stage. This morning was a little glimpse of why I like it. Me: Brayden, what do you want to eat for breakfast? Me (laughing): HOTDOGS?! Ewww. We don't eat hotdogs for BREAKFAST. What else would you want. Me: yes, breakfast. waffles or oatmeal. Brayden: Waffles or oatmeal. Ummm.... WAFFLES! Buzz eat waffles too. 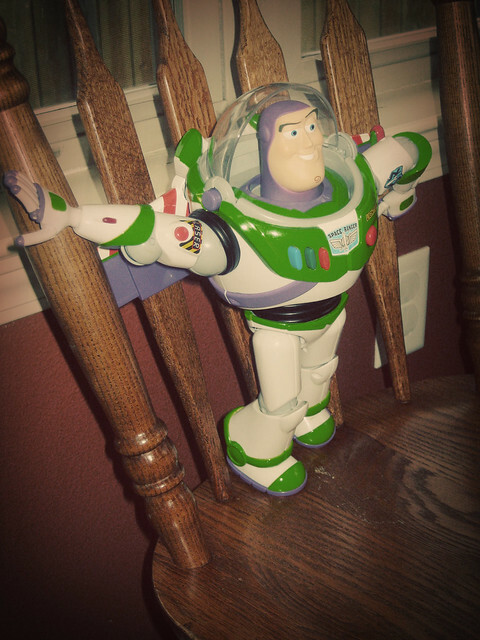 He sits right here (putting Buzz at the table in one of the two chairs that don't have high chairs in them). Buzz eating breakfast with us.